Please type your desired tags, e.g. Theoretical, Physical or Analytical, Infectious Disease, Chemistry, Critical Infrastructure, Computer Science, Information Theory, GRO-seq, Enhancer Mechanisms, Software Engineering, design, Mental Health, International Development, Public and School Libraries, Women’s History, Higher education, and etc. Geographic information systems and the role of information technology in the public sector. Regional economic and demographic development, particularly the role of technological change in communications and transportation infrastructure. Professional Organizations: Geospatial Information & Technology Association, Association of American Geographers, Urban and Regional Information Systems Association. Expert Witness/Legal Consultant (in the area of geographic information systems): Aon Benfield Global, Inc. v. Guy Carpenter and Company Civil Action No. 11-cv-3529 PKC (S.D. NY), for Defendant. Pictometry International Corporation v. Geospan Corporation, Civil Action 11-CV-1423 JRT/LIB, for Defendant. Geospan Corporation v. Pictometry International Corporation, Civil Action No. 08-CV-00816 ADM-JSM (D. of Minnesota), for Plaintiff. SourceProse Corporation v. Fidelity National Financial, Inc. et al., Civil Action No. 2:04-cv-00265-TJW (E.D. Tex. ), for Plaintiff. Consultancies: Quinn Emanuel Urquhart & Sullivan, LLP, Washington, DC; Gibson, Dunn & Crutcher, LLP, New York, NY; Maslon, Edelman, Borman & Brand, LLP, Minneapolis, MN;Slater and Matsil, LLC, Dallas, TX; US Geological Survey; Texas Instruments, Inc.; Collin County Community College District; Dallas County Community College System; North Central Texas Council of Governments; Marketing Information Data Systems, Inc.; Population Research Center, University of Texas at Austin; J. Walter Thompson, Inc.; Republic of Texas Corporation; Dallas Public Library; Council for Advanced Transportation Studies, University of Texas at Austin; Texas Department of Highways and Public Transportation; Texas Department of Community Affairs; Texas Department of Human Resources; Governor’s (Texas) Office of Educational Research and Planning. Appointed and Elected Positions: Delegate, University Consortium for Geographic Information Sciences, (1998-2008); Executive Director, North Texas GIS Consortium, (1997-99); President, Southwest Division, Association of American Geographers, (1981-1982); Secretary-'Treasurer, Southwest Division, Association of American Geographers (1980-1981); Executive Committee, Southwest Social Science Association (1981-1982); Associate Editor, Social Science Quarterly (1979-90); Program Chairman and Executive Committee member, Texas Economic and Demographic Association, Dallas/Fort Worth Chapter (1981-84). Conference Organization: Category Co-chair for Earth and Space Sciences, Intel International Science and Engineering Fair, Fort Worth, Texas, May, 1998; Local Arrangements Committee, Fort Worth meetings, Association of American Geographers April, 1997; Geography Program Committee member, Southwest Social Science Association, annual meetings, San Antonio, Texas, March, 1982; Organization Committee Member, Fall Meetings, Southwest Division, Association of American Geographers, Austin, Texas, October 1981; Geography program chairman, Southwest Social Science Association, annual meetings, Dallas, Texas, March 1981; Organization Committee member, Regional Conference for Census Data Users, Arlington, Texas, February, 1981; Manager and Organizer, Convention Placement Service, annual meetings, Association of American Geographers, San Antonio, Texas, (1982); Local Arrangements Committee, San Antonio meetings, Association of American Geographers, San Antonio, Texas, April 1982; Organization Committee member, Second Southwest Conference on Mobility Programs for the Transportation Disadvantaged, Houston, Texas, August, 1978. Major University Committees at UT Dallas: Information Resources Security, Planning and Policy Committee (chair, 2005-2007), Committee on Qualifications (1997-1999), Information Resources Policy and Planning Advisory Committee (1997-1999), Committee on Information Resources (1992-1995), Faculty Advisory Council for Academic Computing (1984-1992 ), Committee on Research (1979-1981) Academic Council (1977-1979; 1995-1996), Academic Senate (1977-1981; 1995-1996), Committee on Qualifications (1977-1979), Committee on Faculty Standing and Conduct (1976-1979), Chairman, Social Science Dean Search Committee (1977-1978 and 1986-1987), Social Science Personnel Review Committee (1977-1981), Social Science Graduate Studies Committee (1977-1981). Major University Committees at UT Austin: Council for Advanced Transportation Studies (1972-1974), University Council on Teacher Education (1973-1975), Faculty Council, College of Social and Behavioral Sciences (1975-1976), Advisory Committee on the Social Science Computer Laboratory. 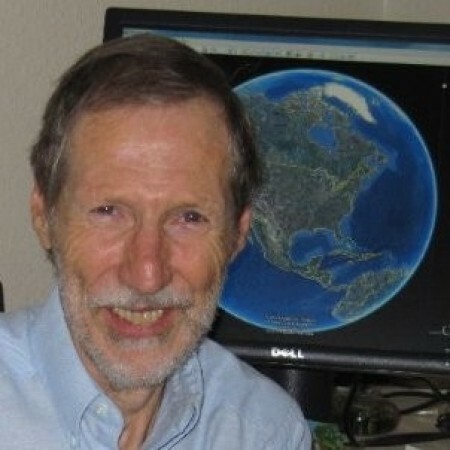 Dr. Ronald Briggs is Professor Emeritus of Geography and Geospatial Sciences at the University of Texas at Dallas and a Certified GIS Professional (GISP). From 1995 until his retirement in 2008 he established, directed and taught in the Geospatial Information Sciences program. Prior to this he served as Executive Director for Information Resources (1991-1995) and Director of Academic Computing (1982-1991) for the university. He received his Ph.D. from the Ohio State University in 1972 and was a faculty member at UT-Austin from 1970 to 1976 before joining the UT-Dallas faculty. His major academic interests concern geographic information systems (GIS), especially applied to the management of urban infrastructure. He was the founder of the Graduate Certificate in Geographic Information Systems (1995), the Master of Science in Geographic Information Sciences (1998), and the Doctor of Philosophy in Geospatial Information Sciences (2005) programs at UT Dallas. His research has been funded by the US Environmental Protection Agency (for the development of a GIS-based model for the location of Waste-to-Energy conversion facilities), by the US Geological Survey as a part of that agency’s National Spatial Data Infrastructure initiative, by the National Science Foundation (including studies of adoption of computerized control in the manufacturing industry and its impact on regional development), by the US Department of Transportation (including a major study of the impact of the Interstate Highway System on development in non-metropolitan areas), and by a number of state and local agencies. He has published over fifty articles, book chapters and reports. His leadership role in the North Texas GIS Consortium (the functions of which are now performed by the North Central Texas Council of Governments) laid the foundation for the Dallas Fort Worth region’s digital ortho imagery and digital landbase using geographic information systems (GIS) technologies. This included one of the first cooperative, metropolitan-wide digital orthoimagery acquisitions in the nation in 1994-95 and again in 1997. These activities were conducted in conjunction with the Bruton Center, which he chaired from 1995 to 1998. He continues to serve on the North Texas GIS Coordinating Council. During the period from 1982 to 1995 when he directed computing and communications for the university, he oversaw the transformation of the information technology environment from a remote entry, punch-card based system into a modern, network-based environment, including the establishment of one the first Internet connections into the Dallas/Fort Worth region in 1987. He has served on the Board of Directors of the Corporation for Research and Educational Networking (better known as “BITNET,” a predecessor to the Internet in the academic community), was a member of the University of Texas System Information Technology Council (1982-1995), and served on the committee which drafted the first State of Texas Strategic Plan for Information Resources Management in 1990. Although formerly retired from UT-Dallas since 2008, he continues to be active in the field serving on Ph.D. dissertation committees, conducting cooperative research with students (his most recent work is in press for Cartography and Geographic Information Society Journal, October 2012), reviewing manuscripts for journals, serving as distinguished professor at Henan University, Kaifeng, China, as a member of several advisory committees including the Texoma Council of Governments GIS Advisory Committee and the North Texas (Dallas-Fort Worth) GIS Coordinating Council, and providing expert witness/consultant services on GIS, remote sensing and photogrammetry for patent litigation. Member, North Texas GIS Coordinating Council, 1999-. Executive Committee, North Central Texas Consortium for Transportation Research 1997-2000. Co-chair for Earth and Space Sciences, Intel International Science and Engineering Fair, Fort Worth, Texas May, 1998. Member, Board of Directors, Corporation for Research and Educational Networking (“BITNET”) 1992-1995. Member, Universityof TexasSystem Information Technology Council, 1982-1995. Member, State Strategic Plan Advisory Committee, Texas Department of Information Resources, 1989-1990. Director, North Texas Region, Texas State Data Center, 1985-1990. Member, Regional Data Center Advisory Committee, North Central Texas Council of Governments, 1986-1988. Member, Committee of the Future, Subcommittee on Regional Data and Services, North Central Texas Council of Governments, 1984-1986. Chairman and Contact Person, Austin Standard Metropolitan Statistical Area Census Tract Committee, U.S.Bureau of the Census, 1974-976. Member, Transportation Task Force, Capital Area Planning Council, Austin, Texas, 1975-'1976. RICHARDSON, Texas (Feb. 9, 2005) – The University of Texas at Dallas (UTD) next fall will begin offering one of the nation’s first Ph.D. degrees in geospatial information sciences (GIS) – an important, fast-growing new field that melds data collection, mapmaking and spatial analysis. The new degree program, approved late last month by the Texas Higher Education Coordinating Board, will expand an existing, well-respected GIS program at UTD that offers both an M.S. degree and graduate certificate in the field. In keeping with the interdisciplinary nature of the program, the Ph.D. degree will be offered jointly by three of the university’s schools – the School of Social Sciences, the School of Natural Sciences and Mathematics and the Erik Jonsson School of Engineering and Computer Science.